Leavine Family Racing (LFR) announced today that it will once again partner with the FDNY Foundation aboard the No. 95 Toyota Camry for the third season in the Monster Energy NASCAR Cup Series. The FDNY Foundation provides funding for programs that advance the New York City Fire Department’s goals, which include maintaining operational excellence, reaching out to the community with an array of fire and health safety programs, and increasing diversity within the Department’s uniformed ranks. FDNY members are renowned for their bravery and passion for service. In 2018, they responded without hesitation to an astounding 1.7 million calls. The FDNY Foundation and Leavine Family Racing are teaming up to respond to the FDNY’s request for a state-of-the art training simulator by working together to bring awareness of the Foundation’s efforts to the NASCAR industry. The Pump Panel Simulator will combine with the Foundation’s driving simulator, which NASCAR helped provide to the FDNY, to train Firefighters on what are perhaps the most crucial and stressful minutes of fire response: arriving quickly and safely to the scene and the urgency to get the right amount of water to the right hoses for rapid extinguishment. With heavy call volume in the country’s most densely populated city, firefighters don’t have a second to spare when arriving to a fire. The Pump Panel Simulator works with the driving simulator to give trainers a cutting-edge resource to create realistic scenarios depicting driving to a fire and making the split-second decisions that regulate the water volume and pressure needed. Practicing in a safe, controlled environment allows Firefighters to hone their skills so that when they are called upon to perform under the most challenging conditions, they are able to fulfill their sacred pledge to save lives. Giving their members the opportunity for rigorous, ongoing training improves safety for Firefighters and the public. “The FDNY Foundation is very grateful and thrilled for this partnership with Leavine Family Racing and NASCAR to fund a state-of-the-art Pump Panel Simulator for the FDNY Training Academy,” said FDNY Foundation Executive Director Jean O’Shea. “We are extremely proud to, once again, recognize the brave men and women of the FDNY and the efforts of the FDNY Foundation while showcasing the NASCAR community’s incredible support and generosity to those who selflessly serve our communities every day,” Matt DiLiberto, LFR Partner and Board Member of the FDNY Foundation. To learn more, or to join the Foundation’s team by donating to the Pump Panel Simulator project, please visit www.fdnyfoundation.org/nascar. After two successful weekends on the short tracks followed by the Easter weekend break, Paul Menard and the No. 21 Quick Lane team head to one of the biggest tracks, Talladega Superspeedway where an all-new rules package will be used. Gone are the traditional restrictor plates that have been used at Talladega and its sister track, Daytona International Speedway, for more than 30 years. In their place will be a tapered spacer, the same device that has been used on intermediate tracks this season to reduce horsepower. Further changes for Talladega include a taller rear spoiler, nine inches instead of the eight used at other tracks this season, and a bolt-on track bar mount which will raise the rear of the car one inch to 12 inches. There has been limited testing of the new package, which leaves lots of unknowns heading into this weekend’s GEICO 500. “I’m not sure what to expect,” Menard said. “It’s a different package from what we’ve run there for years. He said he expects to see some drivers trying the tandem moves of several years back, where two drivers hooked up nose to tail to gain speed. “I expect there will be some tandem drafting, but I don’t know how long two drivers can stay hooked up,” he said. One thing Menard is sure of is that there will be more emphasis put on practice, which is a change from previous Talladega weekends, where teams tended to try to limit practice time in hopes of avoiding damage to their cars from a crash. Menard said he and the Quick Lane team are headed to Talladega on a roll after strong runs at Bristol and Martinsville, where they had finishes of sixth and 10th, gained five spots in the standings to 16th place and scored Stage points in five of six Stages in the past three races, dating back to Texas Motor Speedway. Qualifying for the GEICO 500 is set for Saturday at 3:40 p.m. (4:40 Eastern Time), and the race is scheduled to start just after 1 p.m (2 p.m. Eastern Time), with TV coverage on FOX. In April 2018, Kevin Harvick and the No. 4 Busch Beer Ford for Stewart-Haas Racing (SHR) came to Talladega (Ala.) Superspeedway with a fresh, new outdoors-inspired look completely covered in flannel – the unofficial uniform of the true outdoor enthusiast. It was such a hit, especially with fans, that the flannel will return for Sunday’s Monster Energy NASCAR Cup Series Geico 500 at Talladega. Busch Beer has embodied the spirit of the Great Outdoors since its inception in 1955. Again this weekend at Talladega, Busch will continue to honor its deep roots and celebrate those who are passionate about outdoor pursuits. The “Busch Guy” will return sporting his red-plaid flannel shirt and blue jeans – the inspiration for the livery of the No. 4 Busch Beer Flannel Ford Mustang. When Harvick and the No. 4 Busch Beer Flannel team roll into Talladega for Sunday’s race, the team will be draped in the red-checkered fabric. Harvick’s Busch Beer firesuit, the crew’s shirts, the fan display and even the paint scheme of the No. 4 Busch Beer Ford will all feature flannel. The Busch Guy, decked out in flannel, will be on hand throughout the weekend to cheer on the Busch Flannel team to victory. Fans can support Harvick by shopping at https://store.stewarthaasracing.com/ where a wide variety of flannel merchandise is available. And Harvick is hoping to put the Busch Beer Flannel Ford Mustang in victory lane. He will make his 37th NASCAR Cup Series start Sunday at the 2.66-mile oval where he has one win, two poles, seven top-five finishes, 15 top-10s and has led 260 laps. Harvick scored his lone Talladega win in April 2010, when he started fourth, led two of 200 laps and beat runner-up Jamie McMurray by .011 of a second. He earned his first Cup Series pole at Talladega in May 2005 with a speed of 189.804 mph. He won his second Cup Series pole in April 2018, when he recorded a lap of 49.247 seconds at 194.448 mph. Harvick has three career Cup Series runner-up finishes at Talladega, most recently in October 2010, when he started 14th, led 12 laps and finished runner-up to his now-SHR teammate Clint Bowyer. Harvick is hoping flannel will be the magic touch that will lead him to his first victory of 2019. "I'm ready to head to Talladega after the off-weekend. It can definitely be an intense race and you have to find the balance between being patient and being aggressive. I think we'll see some good speed in our No. 36 Surface Sunscreen/Tunity TV Ford and if we can stay out of trouble, we'll have a shot at taking the checkered flag." Recent winning history on the Talladega Superspeedway high banks has been dominated by a distinctive blue oval. Ford drivers hold a seven-race winning streak as the Monster Energy NASCAR Cup Series heads to Alabama for Sunday’s GEICO 500 (2 p.m. ET on FOX, MRN, SiriusXM NASCAR Radio) – the winningest stretch for a manufacturer in more than a decade of competition on what is ironically considered one of the most unpredictable venues. Not only has Ford owned the party in Talladega’s famous Victory Lane since 2015, they have utterly dominated the competition – leading 58.8 percent of all laps run in the last seven-race span - 785 of the 1,336 laps of competition. Team Penske driver Joey Logano scored his third Talladega Superspeedway win in this event last April, leading a race best 70 laps and holding off another Ford teammate, Kurt Busch for the trophy. In the last Monster Energy Series race on the Alabama high banks - during October’s Playoff portion of the schedule – Stewart-Haas Racing’s Aric Almirola took a different, more concise path to the win, leading only the last lap. His SHR teammate Clint Bowyer was second followed by 2017 Talladega winner Ricky Stenhouse Jr. earning Ford a true podium sweep. Ford driver Kurt Busch won the pole position and led a race best 108 of the 193 laps in that race only to finish 14th. In Logano’s win last April, seven Ford drivers combined to lead 126 of the race’s 188 laps - 67 percent of the race. In Almirola’s victory, Ford was even more dominant. Six Ford drivers combined to lead 184 of the race’s 193 laps or 95.3 percent of the race. Ford drivers have led at least 58 percent of the race laps in four of the make’s last seven Talladega wins, including the last three races. With each of Ford’s wins in this span, the statistics have been increasingly impressive. And with three wins through the opening nine races of 2019, Ford has already established good pace. Team Penske's two Monster Energy NASCAR Cup Series championship drivers Brad Keselowski (2012) and reigning champ Logano - who have hoisted three race trophies in 2019 - have combined to earn eight trophies at Talladega making them-the most decorated among the current competition. The duo have won five of the last seven races and led a combined 426 laps in that time – 54 percent of Ford’s total laps out front. Four times – twice each – they have led the most laps in a race. And over the course of the last 10 races, Logano’s 235 laps out front and Keselowski’s 229 laps led are most among Cup drivers. Perhaps Keselowski summed up the team’s feelings best two seasons ago – in the days before claiming his career fifth win at the track. Even so, Penske drivers aren’t the only ones in Talladega tip-top strata. In Almirola’s win, his Stewart-Haas Racing teammate Kurt Busch led a race high 108 laps in his runner-up finish – the most laps led by one driver since Matt Kenseth led 142 and finished eighth in May, 2013. Only three times since then has the driver who led the most laps won the race – Dale Earnhardt Jr. in Spring, 2015, Keselowski in Spring, 2016 and Logano in this race last year. Two other Ford drivers have joined the Penske duo in Victory Lane celebrations during the manufacturer’s current winning streak – Almirola last October and Stenhouse Jr. in 2017 when he claimed his first Cup victory. Stenhouse went on to score his second series win three months later at the Daytona summer race. While Team Penske drivers have already celebrated with trophies and Almirola has come close, Stenhouse sees this weekend, in particular, as an ideal chance to earn a win and his shot in the season-ending Playoffs. However, as is typically the case on the big tracks such as Talladega, he’s just unsure what to expect in race condition. “Back in the day, I felt like you had a lot of friends when you had a fast car but now if you have a fast car they want to shuffle you out so they don't have to contend with you," Stenhouse said. “Now going into speedways a lot of times you can do a lot of things on your own at Talladega and Daytona now. While last year’s dominant SHR team is still looking for its first win of 2019, three of its four drivers do have previous Talladega victories. Kevin Harvick and Clint Bowyer swept the 2010 season while driving for different teams and Almirola scored his dramatic Talladega win in his first season with SHR last year. SHR team drivers Almirola, Harvick, Bowyer and Kurt Busch (now with Chip Ganassi Racing) led 155 of the 193 laps in Almirola’s victory last Fall. “Attitude is a big part of this, but it goes toward being a student while you’re out there, learning as much as you can. That’s the tricky thing about these situations at these racetracks." On the last lap of the fall 2018 Monster Energy NASCAR Cup Series race at Talladega (Ala.) Superspeedway, Aric Almirola, driver of the then-Smithfield Bacon for Life Ford, held off his teammates Clint Bowyer and Kurt Busch to win the most important race of his career. When Almirola crossed the finish line, he secured his spot in the Round of 8 of the NASCAR playoffs and went on to finish fifth in the standings – the best season of his career. There was sheer excitement over the radio when Almirola took the checkered flag. He screamed, “Woohoo! Yes! We finally did it!” But he was hungry for something else when he stepped out of the car. While Almirola gave his live interview expressing his relief in being able to advance to the next playoff round, he turned to the roaring crowd and said somebody out there watching was going to win bacon for the rest of their lives – and someone did. Joseph Craig from Little Rock, Arkansas, was surprised at his home by Almirola this past offseason with a lifetime supply of bacon, and he mimicked Almirola after his Round of 12 win at Talladega (watch here). In Almirola’s last five starts at the 2.66-mile Talladega oval, he’s earned one win, three top-five finishes and five top-10s. In his 18 Cup Series starts there, an accident ended his day prematurely just once. In the typically accident-mired event, he’s led a total of 15 laps. Almirola’s first career Cup Series victory was captured in 2014 at Talladega’s sister track, Daytona (Fla.) International Speedway. The Tampa native has also found his way to victory lane in his career at the Alabama track in the NASCAR Xfinity Series. In 2017, Almirola led 13 laps before going on to capture the victory there while piloting the No. 98 Ford for Biagi-DenBeste Racing. Ford had shown strength at superspeedways with 18 wins in the last 32 Daytona and Talladega events combined. In the Cup Series, Ford has captured 10 wins in the last 13 Talladega races. Talladega is the seventh points-paying event during which the Smithfield livery will adorn Almirola’s No. 10 Ford Mustang this season. 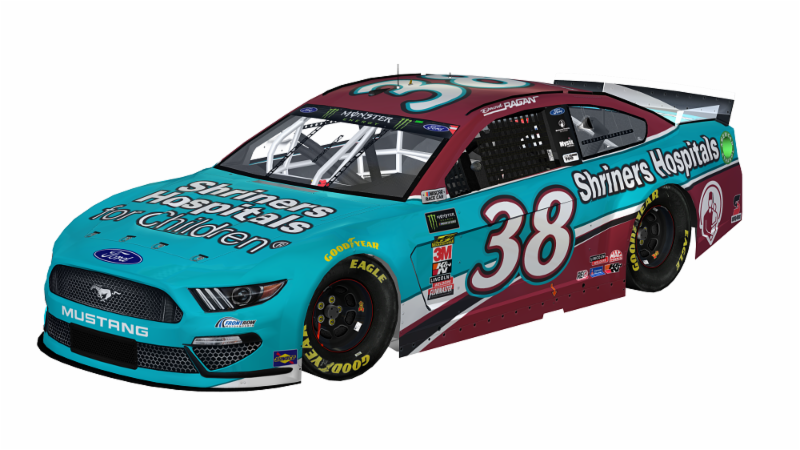 Smithfield, a brand of Smithfield Foods, which is based approximately five hours northeast of SHR headquarters in Smithfield, Virginia, is in its eighth season with Almirola and its second with SHR. Founded in 1936, Smithfield is a leading provider of high-quality pork products, with a vast product portfolio including smoked meats, hams, bacon, sausage, ribs, and a wide variety of fresh pork cuts. Almirola heads to the 10th race of the 2019 season 11th in the championship with 260 points – 140 out of first. His highest points position this season was fifth before bad luck struck the No. 10 Ford Mustang team at Bristol (Tenn.) Motor Speedway three weekends ago and issues with lug nuts at Richmond (Va.) Raceway two weekends ago. Prior to Bristol, Almirola earned six consecutive top-10 finishes. The No. 10 Smithfield Ford team intends to reset its streak of top finishes this weekend and earn back-to-back wins at a track where Almirola has found the most success of any other on the 36-race points-paying race schedule. The Bishop, Calif. native is set to make his 24th career Monster Energy NASCAR Cup Series (MENCS) start but first on a superspeedway. Barrett efforts for his first Cup Series race of the season will be supported by Swedish-based Huski Chocolate. Soon to be launched in the United States, Huski Chocolate is a premium organic cold chocolate milk beverage available with refreshing premium chocolate with a chocolate glacier taste. Currently available in the United States, Huski Chocolate services their premium real hot chocolate syrup in the food and beverage industry including ski resorts, hotels and restaurants. 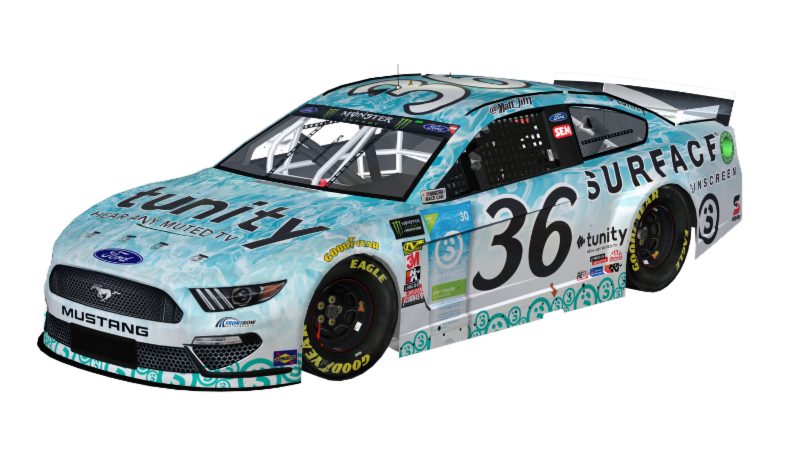 Huski Chocolate will utilize Sunday’s NASCAR Cup Series race to help launch the company’s “ready to drink” chocolate beverage, while also explore other business-to-business initiatives for the Huski Chocolate hot chocolate line. Over the course of his NASCAR career, Barrett has made five starts at Talladega (Ala.) Superspeedway between the NASCAR Xfinity Series and NASCAR Gander Outdoors Truck Series. In 1999, he earned a personal track best of 15th. While expecting a very competitive race abreast a new rules package and the introduction of tapered spacers, Barrett says a good day will be finishing the race in one-piece with a solid finish. “There are a lot of unknowns going into this weekend’s race. I’ve ran up front many times at superspeedways and seem to get caught up in the “big one” but we hope this weekend will be different,” added Barrett. “We’re already locked into the race – so we’ll be working on finding the right balance with our No. 52 Huski Chocolate Chevrolet and make sure when we need to put ourselves in the right place we can do so. Rick Ware, team principal of Rick Ware Racing says the team is thrilled to welcome Barrett back to the team. stablished as a national identity in 2014, the Scott Hamilton CARES Foundation is dedicated to changing the future of cancer by funding advanced, innovative research that treats the cancer while sparing the patient. 22 Kill, a community that raises awareness and combats suicide by empowering veterans, first responders, and their families through traditional and non-traditional therapies will adorn the side panels. And Heroes on the Water will also see their decals on Barrett’s car Sunday. Heroes on the Water is a veteran’s charity, creates alternative therapeutic programs to serve veterans, active-duty military personnel, first responders and their families. These experiential programs incorporate structured activities proven to improve the lives of these men and women. Each experience reduces the impact of post-traumatic stress and traumatic brain injury while providing much-needed camaraderie and support. Veteran industry leader George Church will call the shots as crew chief for in the 10th Cup race of the season. To learn more about Huski Chocolate, please visit huskichocolate.com, like them on Facebook, follow along on Instagram (@huskichocolate) and follow them on Twitter (@huskichocolate). For more on Stanton Barrett, please like his Facebook page, follow along on Instagram (@stantonbarrett). He is also active on Twitter. You can follow and Tweet with him @stantonbarrett.